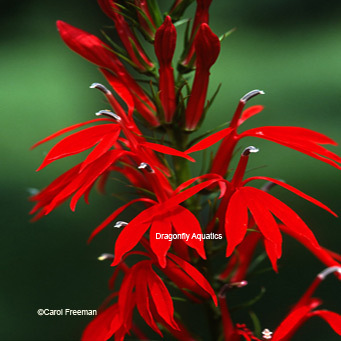 Cardinal Flower (Lobelia cardinalis) Nice Plants! Enjoy intense crimson red spikes of flowers July through September. Very easy to grow and winters over well. Attracts hummingbirds and butterflies. IMPORTANT: When first planting only give it moist soil and gradually increase depth of water once established or it can cause the plant to die back when given too much water at first.